Yes, you have heard right! Cosmetic with goats milk! Sounds interesting? Well, I tried it for the first time a couple of days ago. Don´t be scared! It certainly does not smell like goat. LOL! I tried a couple products from Ziaja (pronounced Ji-ya). Ziaja is a 20 year old European Skin Care Company from Poland and their products are now also available here in the U.S. (Do you know that I am also European? Can you "read" my accent? haha). Ziaja is known for quality products with natural ingredients and great prices. So, what I tried was the Goats Milk hand creme, the Goats Milk Day Creme and the Natural Olive Cream. The packaging is minimalistic, but elegant. I have the hand creme now on my night stand to get my nightly treatment! Fits perfect there! All 3 of the products I have tried smell light, fresh and not overpowering. They instantly penetrate your skin and they do not leave a greasy feeling on your skin. My skin felt immediately hydrated without any oily residue. I am in love with the fresh scents also. It just smells clean and pure! It reminds me a little bit on baby products but in a elegant way. The mommy version! I really recommend these products if you like light, fresh scents. My only little complaint would be that they have not included SPF in their day creams. I think it is highly important to always wear sunscreen. Well, I do live in Florida and here it is even more important! So, I just use the day cream for the night! haha! Ziaja offers a full line of cosmetics from a face mask, to a body scrub or even an enzyme peeling! Other than products made out of Goats Milk and Olive Oil they do offer also products with other natural ingredients like Aloe, Argan Oil, Cocoa Butter, Coconut, Cucumber, Marigold, Marine Algae and Orange Butter. (Orange Butter? I need to try this! This sounds amazing!). With prices starting from $4.99 to $9.99 you can not complain! 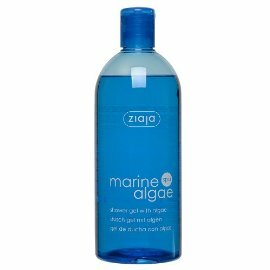 Have you tried products from Ziaja yet? Did you like it? I like to hear your opinion! Oh and also: right now they have a Giveaway on Facebook! Just "like" them and you can win at the end of the month a full Set of Ziaja Cosmetics (value $60!). Disclaimer: I have received complimentary products in exchange for an honest review. All opinions and experiences are my own and I received no compensation for them. This entire review was written only by me and was in no way influenced by Ziaja.